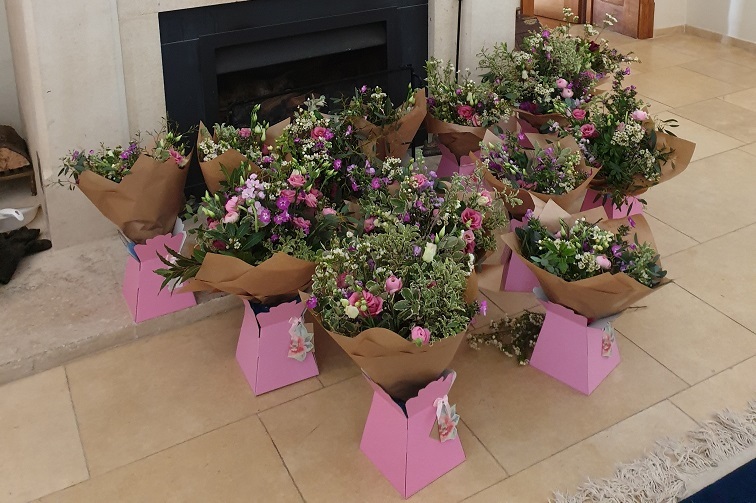 Last weekend I drove down to Shapwick with a van full of gorgeous flowers and foliage to show a group of hens how to make hand tied bouquets. The workshop had been booked by the sister of the bride but I didn’t realise this was a surprise, so when I turned up she didn’t know what I was there for and was excited to see all the flowers being brought in. The group were staying in a lovely house which had a balcony overlooking the dining area, making it a perfect spot to get a group photo. Everyone really enjoyed getting a chance to be creative and learn a skill they can use again at home. When I got home I had a lovely message to say ‘We had a brill time and everyone loved it’. If you are planning a hen party and would like to do something flowery please get in touch and we can tailor something to suit you. I have showed groups how to make flower crowns (which you can wear out that evening), table decorations, bouquets and even planted terrariums. Email me to find out more.